Spring has finally arrived in Northern Ohio, which means it’s (finally) time to head outdoors and get some exercise in the warm fresh air. One of the easiest ways to get moving is to walk or run. The blooming trees, chirping birds and sunshine can make the activity feel less like exercise and more like an enjoyable activity. Still not sold? Consider what walking and running can do for your heart. Running is not for everyone. Many people have an injury or limitation that prevents them from pounding the pavement, while others just don’t like the idea of a fast-paced, sweaty activity. Not to worry. A national study conducted at Lawrence Berkeley National Laboratory in California analyzed about 50,000 walkers and runners over a period of six years. Participant ages ranged from 18 to 80, with the majority in their 40s and 50s. Hippocrates said, "Walking is a man's best medicine" and two scientists from University College London decided to see if he was right. They performed a meta-analysis of research published between 1970 and 2007 and identified 18 studies involving a total of 460,000 walkers who were tracked for an average of 11 years. “Walking reduced the risk of cardiovascular events by 31 percent, and it cut the risk of dying during the study period by 32 percent. These benefits were equally robust in men and women. Protection was evident even at distances of just 5½ miles per week and at a pace as casual as about 2 miles per hour. The people who walked longer distances, walked at a faster pace, or both enjoyed the greatest protection,” explains Harvard Health Publishing. Among 44,452 male health professionals, walking at least 30 minutes a day was linked to an 18 percent lower risk of coronary artery disease. Among 72,488 female nurses, walking at least three hours a week was linked to a 35 percent lower risk of heart attack and cardiac death and a 34 percent lower risk of stroke. Running can also improve your heart’s health, but because it is a more vigorous activity you should first check with your doctor, especially if you have health conditions such as heart disease or arthritis. Marathon runners and high-mileage runners have other health concerns too, so let’s focus on the casual runner who puts in less than 30 miles a week. One of the advantages of running instead of walking is that it takes less time to get a healthy boost. For instance, a 15-minute jog burns about the same number of calories as a brisk half-hour walk. Duck-chul Lee, a professor of kinesiology at Iowa State University and a co-author of the study, said it’s unclear why running increases mortality, but it’s likely due to its positive impact on common risk factors for early death, such as high blood pressure and extra body fat, especially around the middle. Whether you plan to start walking or running, make sure you head out in a stable, supportive pair of shoes. For the first pair, it pays to go to an athletic shoe store, so you can get your feet measured and try on shoes for fit and comfort, then you can turn to online stores for future pairs. Start slow, 15 minutes or a half a mile, gradually increasing time and distance. Find ways to increase your mileage while doing errands and other tasks. Park the car away from the store. Take the stairs instead of the elevator. Volunteer to walk dogs at an animal shelter. Speaking of signing up, join a running club or attend a nature walk at your local park. And don’t forget to enjoy the sights, sounds and smells of spring. Situated on 107 beautiful acres, the Kendal at Oberlin campus features ponds and woodlands, walking trails and numerous amenities, including a swimming pool, therapy pool, fitness center and gardens. Our Fitness Center staff specializes in helping people customize a wellness program that fits their individual needs. 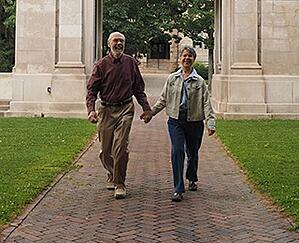 To learn more about what Kendal at Oberlin offers, contact us for information or to schedule a visit.